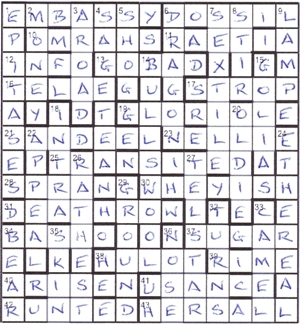 It had been two years since Llig’s last puzzle, with its Psalm 139 theme (Whither shall I go then from thy presence?). That one was fairly straightforward, so I hoped for a similar one after the previous week’s tough Ifor puzzle which I didn’t blog (slap wrist); however, there were two excellent blogs from Shirley and Tim. Here we had a misprint in the definition of one word in each row and some jiggery-pokery with six down entries. I was pleased that the first scan through the clues enabled over a dozen entries to be slotted in. I didn’t know whether any of the downs would soon be changed thematically, but so far everything fitted together. However, GROUNDHOG, BEAR PIT and SKINFLINT soon came to the rescue, with HOG, PIT and FLINT appearing to be superfluous to requirements. If only I’d known that EPITASES were “the main actions of a Greek drama leading to the catastrophe”, the whole thing might have slotted into place sooner, since the clue Actions before dramatic Greek catastrophe sees a revolt (8) only had wordplay for EASES ([SEES A]*) with the PIT omitted. Of course, it wasn’t obvious to me at this point what HOG, PIT and FLINT had in common. That would have to wait for the message spelt out by the corrected definition letters: Sisyphean toil. I was slightly held up with this, having the wrong definition at 17ac Furs and wines returned (5) where I had Fuss rather than Fury for STROP. I knew that the Sisyphus was a fairly arrogant, sadistic and generally-not-very-nice Greek who was rewarded for that by being forced to roll a huge boulder up the side of a hill, only to have it roll back down and have to repeat the task. In Llig’s puzzle, however, he got off lightly, having much smaller stones to push uphill! Nevertheless, this was an entertaining puzzle with some enjoyable clues. I particularly liked 38ac Gauche character thus exposed by French department (5) if only for reminding me of the fabulous Jaques Tati, aka Monsieur Hulot. This entry was posted on 17 November 2017 at 4:00 pm	and is filed under Solving Blogs. Tagged: Llig, Rock Group. You can follow any responses to this entry through the RSS 2.0 feed. You can leave a response, or trackback from your own site.